The museum brings to light two important milestones in the history of Northern England - one in 1825 and other in 1913. In 1825, the Newcastle region was thinly populated and the industrial revolution played an important role in the development of the city. The coming of railways accelerated the change. By 1913, the region witnessed the setting up and growth of heavy industries. Today the museum demonstrates the life in that period and provides entertainment and education for visitors of all ages and interests. 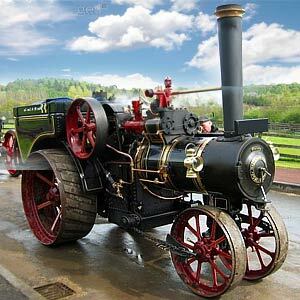 The Beamish museum has an extensive collection of objects, furniture and machinery of the early years. Most of the recent shops, buildings and houses at the site were reconstructed from elsewhere in the region and rebuilt here. However, the Drift Mine, Home Farm and Pockerley home have always been in the region. With nearly 70 buildings and a vast collection, a visit to the Beamish open air museum would take you the greater part of the day. When you are right there, don't forget to shop at the 1920's high street, Grocery shop and the Haberdashery store. The museum has a sweet factory and confectionary shop where you can find boiled sweets and the old fashioned sherbet. The old British trams never fail to attract visitors at the Beamish open air museum. You can take a ride through the manor house and farm, complete with animals such as horses, cows and pigs. Watch out for the pit cottages that have traditional Geordie netties and proggy mats.